MFP began in 1984 when then Legal Aid Managing Attorney Suzanne Gladney (now retired from Legal Aid and MFP) discovered that many of her rural western Missouri Immigration clients worked in the apple orchards along Highway 24 in Lafayette County. She soon realized their needs extended well beyond immigration applications for family members. Although they had housing, their health status was poor and their access to services very limited. Their children felt lost and often overlooked in school, and pictured no future beyond life in the fields and orchards. They existed, literally and figuratively, on the margins of the communities where they lived and labored. Suzanne and the small staff she began to assemble shared a deep concern about these families, particularly the future of children growing up in such difficult and confining circumstances. The staff gathered an ecumenical group of local churches and organizations to support emergency food assistance; organized caravans of doctors, nurses, and dentists to go to the Lexington area; and arranged specialized healthcare in Kansas City. MFP also started to document the number of migrants in Missouri, and guided schools and health providers in Lafayette County and southeast Missouri -- the Bootheel -- to apply for government funding for migrant education and healthcare. Many farmworker families say it is because of MFP's accompaniment and support that they return to Western Missouri each fall, and an increasing number have decided to settle here permanently. Today a fully-staffed local health clinic serves farmworkers and other low-income residents. Schools demonstrate a more just and equitable response to migrant students through better services, greater inclusion of students and parents in activities and decision making, and proactive measures to address discrimination. It is now commonplace for migrant students to graduate from high school and even attend college. Increasingly, adults are moving into the non-farmwork economy -- working in schools, social service agencies, nursing homes, healthcare, and local government jobs. They are assuming leadership positions on parent advisory committees and clinic boards. They are visible in their community and have visions of expanded opportunities for themselves and their children. MFAF was established as a separate non-profit in 1998, and was accorded 501c3 IRS status in 2003. 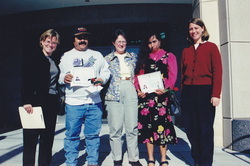 MFAF serves and empowers Missouri's farmworkers.